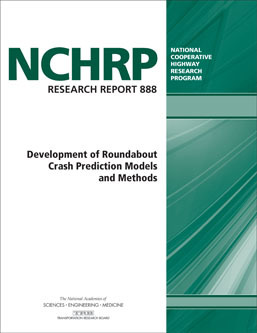 TRB’s National Cooperative Highway Research Program (NCHRP) Research Report 888: Development of Roundabout Crash Prediction Models and Methods provides crash prediction models that quantify the expected safety performance of roundabouts for motorized and non-motorized road users. Safety performance factors (SPF) and crash modification factors (CMF) are predictive models that estimate expected crash frequencies. These models are used to identify locations where crash rates are higher than expected, to estimate safety benefits of a proposed project, and to compare the safety benefits of design alternatives. Research indicates that roundabouts provide substantial reductions in crashes, especially crashes that result in serious injuries or fatalities. However, the 1st edition of the HSM did not include a crash prediction method for roundabouts; therefore, practitioners were not able to quantitatively assess the crash reduction benefits of providing a roundabout at a specific intersection or to investigate the safety effects of complex design decisions at singlelane and multilane roundabouts. SPF and CMF models may help identify and prioritize locations for safety improvements, compare project alternatives by their expected safety benefits, and guide detailed design decisions to optimize safety. Research indicates that roundabouts provide substantial reductions in crashes, and this report determines SPF and CMF specifications for roundabouts. The report includes appendices to the contractor’s final report and a PowerPoint presentation.